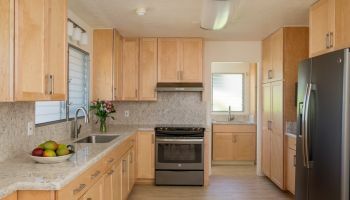 Family owned and operated, Homeowners Design Center has been one of the top home building and home remodeling companies in Hawaii since 1969. They offer everything one needs for a home remodeling project, including flooring, kitchen and bath cabinets, countertops, window coverings and more. Self described as a “one-stop shop,” the company and its expert staff of experienced kitchen and bath designers and flooring consultants are well-versed at updating your home to perfectly fit your needs and wants — and of course working within your budget. A recent home remodel dream that Homeowners Design Center made a reality is the Pregitzer house, a full home renovation that included everything from a complete overhaul of the kitchen, to building a better bath and providing the living area with an entirely new look. Homeowners Design Center's Sales Manager Randall Omoto explains how the company sat down with the homeowner and discovered that he wanted an updated and contemporary style for the home remodel, reflecting a more modern and minimalist feel. “With every client consultation, we realize we are there to not only give information, but to listen,” says Omoto. "We listen — to help the homeowner find (and get) what they truly want out of the remodel." Remodeling the kitchen from a U-shape to an L-shape allowed for 6 workspaces. Part of what helps the company plan for a home remodel is what they call the “want and need list.” For the Pregitzers, this involved remodeling the kitchen — which was U-shaped, and congested with only 3 workspaces — and opening it to an updated L-shape, providing increased access, better flow and 6 workspaces. In remodeling the countertops, after being walked through the various options via Homeowners Design Center’s 20/20 Design program — specialized software that provides a virtual rendering of the proposed design, including all elements and materials (even colors) to the customer — the Pregitzers chose a lovely natural stone, while preferring beautiful bamboo for their custom cabinetry. Old fashioned home remodeling meets modern day technology. By replacing every inch of the old tile flooring with an attractive continuous flooring made of wood-plank vinyl (a near-replica of the real thing), the company was able to open-up the space exponentially. 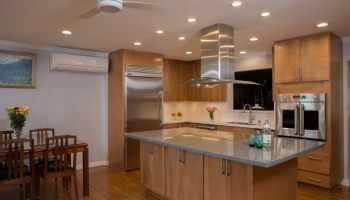 The incorporation of track lighting, accent lighting, built-in soffit and updated appliances, morphed the home's kitchen into a modernized contemporary cucina. Remodeling the countertops with natural stone, beautiful bamboo cabinets and wood-plank vinyl flooring added snazzy updates to this contemporary home remodel. The home’s bathroom was outdated, and by installing floating cabinets which were raised off the floor, Homeowners Design Center delivered a more modern feel, as well as a more minimalist and practical utilization of space. Floating cabinets, one of the most notable features for the bathroom remodel. And what home remodel would be complete without a custom-designed home entertainment center? Omoto explains how, “(Homeowners Design Center) was able to create a prototype using our 20/20 program, so the owners could see what everything would look like” — a revamp which included a customized area complete with open-shelves and floating shelves, making for a more streamlined look and eliminating the need for a bulky sectional to hold any electronics. The addition of a home entertainment center topped off this contemporary home remodel. The final result? A home remodel worthy of contemporary praise. To see more of their home remodeling projects or learn more about Homeowners Design Center, click on the company name anywhere you see it or click on a photo.